Original British Quad (30 x 40 inch) Movie Poster from the 1973 George Lucas coming-of-age nostalgia film American Graffiti starring Ron Howard, Cindy Williams, Richard Dreyfuss and Paul Lemat. Originally folded, this poster has been professionally paperbacked and now displays flawlessly. Condition is Very Fine and paperbacked. As collectors ourselves, we pack every item to arrive undamaged. My web site is one of the oldest and most trusted sources of vintage movie poster and lobby cards on the internet. For more details please see my ME page. 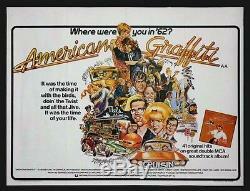 The item "AMERICAN GRAFFITI RON HOWARD GEORGE LUCAS 1973 BRITISH QUAD" is in sale since Sunday, May 4, 2014. This item is in the category "Entertainment Memorabilia\Movie Memorabilia\Posters\Originals-United States\1970-79".com" and is located in Huntington, New York. This item can be shipped worldwide.